Critically acclaimed and award winning, the vapor family is a perfect way to breathe new life into your climbing day. Improving climbers often don't want to stray too far from tried and tested shoes, but increasingly they want to experiment on different types of terrain. 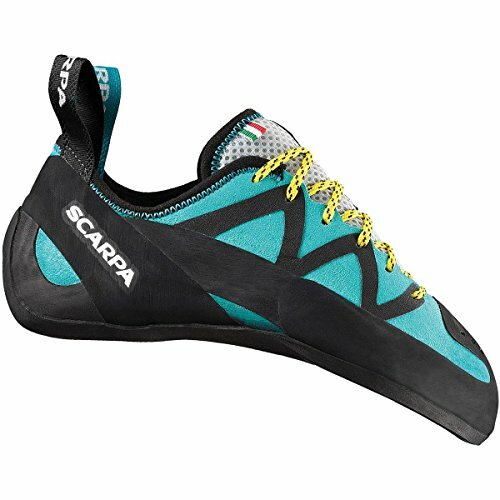 Scarpa appreciates the opportunities that alternative versions of shoes with similar basic designs can unlock. The single piece synthetic upper promotes a new concept in comfort, and minimal stitching eliminates hot spots. The full length outsole and increased stiffness are matched with vibram xs edge rubber to offer the most supportive lace up in the entire climbing collection. The vapor lace is built on the same last and utilizes the same active rand as the vapor v, complementing its softer relative extremely well.